ICE agents carry out military-style raids in Arizona | Fight Back! 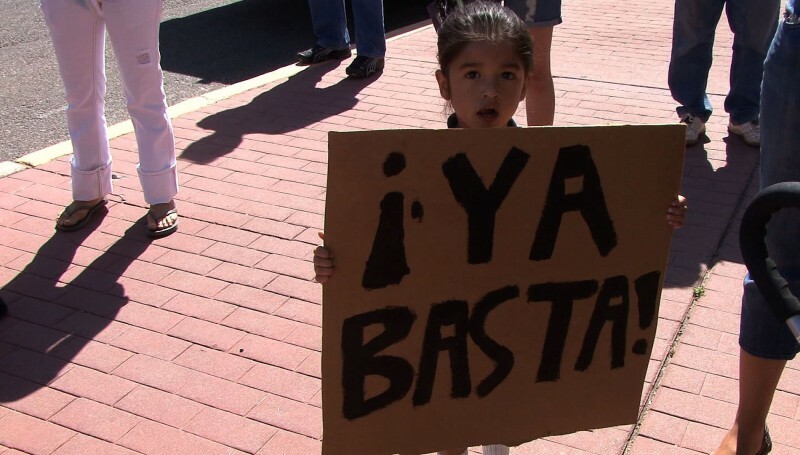 Tucson, AZ - “Tucson today is the moral equivalent of Birmingham, Alabama in 1961,” said Mike Wilson, border rights activist and Tohono ‘O’odham tribal member, at a rally at the Federal Building here, April 15. The rally was held in response series of raids that took place the same day in Phoenix, Tucson, Rio Rico and Nogales, and in the Mexican city of Nogales, Sonora. The raids targeted people traveling on shuttle services, but whole neighborhoods were affected, with traffic brought to a virtual standstill while agents occupied urban areas in the biggest such operation in the seven-year history of Immigration and Custom Enforcement (ICE). Although the rally was organized as an emergency response, with calls going out only a couple of hours before it took place, some 75 people showed up in a diverse crowd of all ages and nationalities. Rally-goers vowed to end the system of racist laws in Arizona with a popular fight back, just like Jim Crow laws of racial discrimination were defeated in the civil rights struggle in the U.S. South in the 1960s. The raids involved over 800 ICE officers and law enforcement officials from local to international levels. Immigrant rights activists fear that the operation signifies a new wave of anti-immigrant repression and border militarization. Andrew Provencio, however, lost the shuttle van that he runs to and from Nogales, Arizona. The van was being driven by his son, Ricardo Gomez, who was questioned, but not arrested by ICE agents. Provencio said he was just beginning to pay the $22,000 loan he had gotten on the van, remarking, “You are not even involved in what’s going on and they seize everything.” Gomez agreed that shuttle drivers are not allowed to ask passengers regarding their immigration status. Border rights activists are concerned about the timing of the raids, coming just two days after the Arizona House passed Senate Bill 1070, which would be the harshest anti-immigrant legislation in the country. Among other things, the bill would require local and state police to enforce immigration law and investigate anyone they suspect of being undocumented. The law also gives citizens the ability to sue police agencies for not enforcing immigration law aggressively enough. Some present at the rally wondered if the timing of the raid signified an endorsement of this new approach. The bill’s sponsor, Republican Senator Russell Pierce, claims that there are already ten states ready to adopt similar measures. Because of the ‘papers on demand’ provisions for anyone suspected of being an undocumented immigrant, the bill implies that everyone, resident, citizen or not, must have identification on their person at all times to verify their immigration status. Anyone who lives near the border knows what this means. English speaking whites who travel between the border and further inland are virtually never asked to provide proof of citizenship when crossing ICE roadblocks or casually coming into contact with law enforcement. But this requirement is routine for Latinos and indigenous persons, especially if Spanish is their first language - which means the law codifies racial profiling. The bill defines any undocumented worker as being in violation of state criminal trespassing laws simply by virtue of being in the state, with mandatory jail time for infractions. It also forbids churches from providing sanctuary to undocumented workers and stops cities from adopting policies that prevent police from enforcing immigration laws. It makes illegal the solicitation of work from, or the hiring of, day laborers. It intensifies the requirement that state agencies demand proof of citizenship for all those seeking services, including those calling for police in the event of domestic violence or other crimes. Martha Ojeda, Director of the Coalition for Maquiladora Justice in San Antonio, has little patience either for Arizona’s pioneering policies of racism (and the tendency of other states to follow them) or for the hypocrisy she sees in the treatment of undocumented workers. She notes that the North American Free Trade Agreement lead to a huge spike in immigration, granting free access for big corporations to cross borders, but not for workers to do the same. She notes that undocumented workers have become an indispensible part of the U.S. economy and that they pay more in taxes and Social Security than they receive in social services. During the raids in Arizona, not only were individuals questioned and arrested, but whole neighborhoods were subjected to a military-style deployment. Kat Rodriguez, also of Derechos Humanos, said, “There was a massive show of force, with helicopters, dozens of agents, police vehicles and weapons, assaulting our community in a fashion never seen before…This action clearly demonstrates what we have predicted, that we would all be living in a police state here in Arizona. How can the Obama administration permit these actions while espousing a commitment to ‘change?’” She added, “We demand an immediate response from the president and Secretary [of Homeland Security] Janet Napolitano, as this community is already scrambling from the Jim Crow-type laws coming from the extremists in the Arizona legislature.” Napolitano was the previous governor of Arizona before taking her current position. I definitely believe that immigration has turned itself into a boomerang for political conservatives…their greed was limitless and did not take into account the consequences. They opened the market and paid hunger wages, obligating people to immigrate. They thought with their invited workers program - the bracero program - they could continue slavery with legitimacy, robbing people of their passports, not paying them [Specific cases like this have been uncovered recently in the states of Florida and Mississippi], thinking that they would have no other alternative than to suffer the oppression. But they were wrong, simply and sincerely because the necessity to survive was bigger and millions of undocumented people broke the frame and didn’t follow the paradigms of slavery.